The Barrows of RuneScape is a dangerous place. When you go exploring here, you will find level 115 and level 98 brothers who can hit up to 600. Those who dare to enter this God-forsaken place and live to tell the tale, will reap the huge benefits this place has to offer. Many people have become rich because of good finds from the Barrows, though many others, like myself, have died in the attempt. Before going there, please read all of this guide; otherwise you may die. 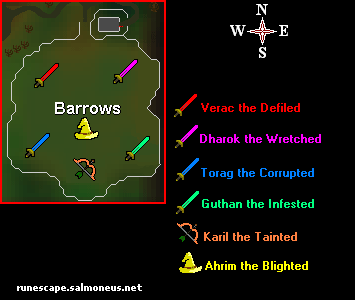 The Barrows are located in the southeast corner of RuneScape. The nearest bank is in Port Phasmatys. 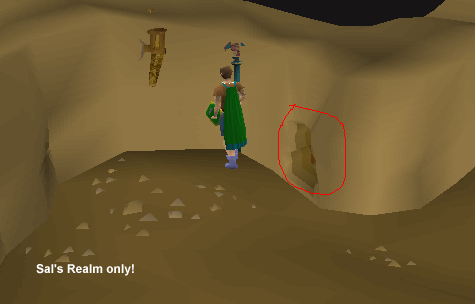 Without using Ancient Magicks, the nearest teleporting point is in Varrock. The only thing needed to gain access to the Barrows is a spade. 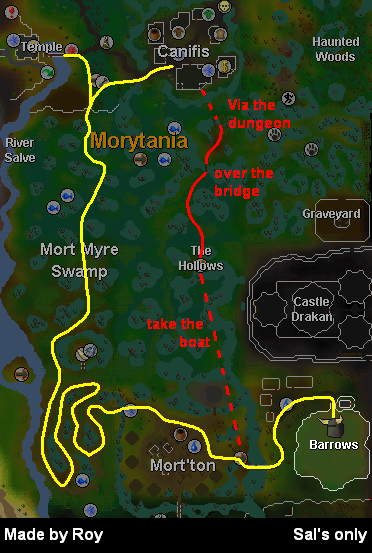 There are two ways to get to the Barrows from Canifis, shown on the map below. While running through the swamp, Ghasts will attack you, and when their attacks are successful, one piece of your food goes rotten. Just drop this; it's unavoidable (unless you want to use a Druid Pouch, which is a waste of time and space). You must run through these swamp areas (from the gate to the twisted path for the yellow route, or the bridge to the boat for the red). This will preserve as much food as possible. If you've done enough of Fairy Tale Part 2: Cure a Queen to use the fairy rings (you won't need to meet the quest requirements), you can teleport into the dungeon from Canifis to the swamp directly using the coordinate "DLS". To the immediate south of the fairy ring is a gap in the wall. Go through it, then you'll be in a room with rats in it. To the northeast of where you came out is another gap. Go through it and you will be on the main path. Of these, four use melee attacks, one uses magic and another uses range. Strategies: Your prayer should make his special useless. For Dharok, your prayer must not run out. Towards the end of the battle he is known to hit high 600's, and could potentially one-hit lower combat levels. Try to tackle him first, with your full prayer. Special: Occasionally hits as though you don't have armour on, and sometimes hits through prayer. Strategies: Your prayer will no longer be a safe haven. He usually won't hit very often, so as long as you have plenty of food left you'll usually be ok. Lower levels should always use prayer against him, however people with 100+ combat can usually do without it (as long as they wear rune). Special: Heals as much as he hits. May also heal a few Life Points when he hits 0. Strategies: The third most dangerous melee brother. Is able to hit 200-270, and can really do some damage sometimes. A high Defence and Magic level, as well as magic dart and rune armour should see you through this battle using a bit of food, but no prayer. Strategies: As with Guthan, prayer is not needed for higher combat levels. Because he is the weakest melee brother, you shouldn't have too much trouble against him. He is effected a lot by magic based attacks, moreso than the other melee brothers. Use this against him. Strategies: Karil is the most dangerous barrows brother. He is the worst to have in the tunnels, so consider yourself unlucky if you end up with him in there. Always pray against him, as he is known to hit rapid 200's. Some prefer to melee him, but magic works just as fine. When using magic dart, do not use rune. 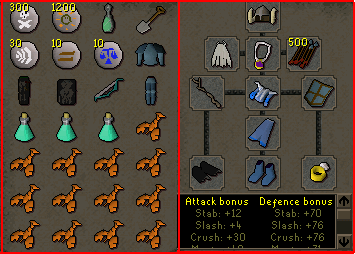 The little decrease in firepower for rune is greatly exaggerated against Karil. If nothing else, take off your armour, because you will (or should) be praying. Special: Lowers your melee stats using spells like confuse and weaken. Strategies: Some dragonhide is the key here. You shouldn't need to pray against him unless you are low on food or Life Points. Range seems to be the most effective means of killing him. If you don't pray, make sure you heal often if he hits you. Although he is the weakest brother, he can still hit well into the 200's. There are many different strategies associated with killing the barrows brothers. I will list three, one for magic dart, one for ancient magic, and another for fire blast, in order to account for most people's needs. You can slightly customize any of these strategies to suit your needs. This method, when used correctly, should use one, or at most two doses of your prayer potion. You will burn through your food supply though. 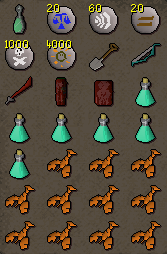 The inventory I recommend is that shown in the picture of what you should bring to barrows. You must have rune plate and legs, dragonhide armour and also magic boosting armour. I used mystic in the inventory picture, but I usually use and prefer splitbark, because of its Defence boosting stats. First, lets get one thing straight. It has been proven by Jagex that your magic bonus does effect how hard magic dart hits. Many don't believe it, but it has been proven. This is the reason for the magic-boosting gear. You should have full prayer. Go to Dharok's tomb, and dig. Use your magic boosting equipment and prayer to kill Dharok. Then get out of the tomb as fast as possible. You should have 10-30 prayer left. Now, keep your magic gear on and go to Verac's mound. Start killing Verac, and when your prayer runs out switch to rune armour. Keep attacking until Verac dies. Over to Guthan now. You won't need to pray against Guthan. Keep your rune on and kill him, eating when necessary. If you get low on food, or Guthan starts hitting big, take a dose of prayer pot and pray to finish him off. Now for the big one. Take a dose of prayer potion, equip your magic gear and dig over Karil's tomb. Kill Karil and get out of there. If Karil is nearly dead and your prayer runs out, as long as you have a few bits of food left just switch to rune and finish him off. Switch to your dragonhide and magic short, and kill Ahrim. He should be easy, no prayer needed. For the tunnel. One of the above brothers should be in the tunnel. When you reach him, it's easy just to skip him and move onto the next brother. This applies for every brother except for Dharok and Verac. If you have a Dharok tunnel, head straight down to Karil and kill him. Then head to Verac, using your remaining prayer, and following the normal order from then on. 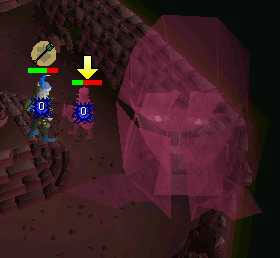 If you have Verac in the tunnel, head down to Guthan to use your remaining prayer, and then to torag, Karil and Ahrim. While in the tunnel, you should go straight to the chest room. Try to avoid the last brother until you are in the chest room. When in here, you can prepare for the last battle before attempting to open the chest, at which time the last brother will try in vein to protect his treasures. This method is the fastest and least expensive way of killing the six brothers. As long as you don't need sharks, this will see you making huge profits. 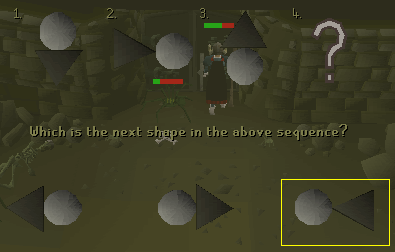 By far the most dangerous of methods, this is strictly for professional barrows players. When using ancients you won't be praying, making the fight against Dharok, especially, hard. 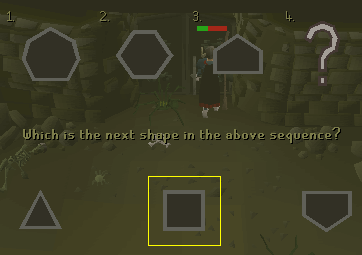 Don't attempt this unless you've had a lot of previous barrows experience, and never bring excess runes or arrows. If you get a lot of lag you will most certainly die. The blood and law runes are for teleporting out. They are not used for attack spells. You should use ice burst. Adapt for the tunnel. You will be able to just skip any of the melee brothers or Ahrim. However, if Karil is in the tunnel for you, your in a bit of trouble. You'll need to take one dose of prayer potion, possibly two before you kill him. He will kill you if you don't pray. Using this method, you will nearly never have to use any prayer potions. This minimizes your costs dramatically. Although you will use more expensive runes, the overall cost will be less than that of the magic dart method. 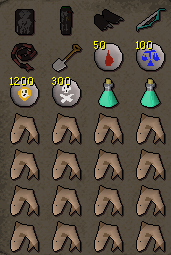 The fire blast method is the most expensive, most time consuming way of doing barrows. The main disadvantage is that you will use death and air runes. Air runes are not a possibly loot from the chest, meaning you will have to consistently buy airs. Fire blast also hits less than magic dart and ice burst, making it take more time to kill the brothers, meaning you will also have to use more prayer. Fire blast is also effected a lot by your magic bonuses, thus meaning you can't wear rune to protect you from torag or Guthan, you must consistently pray. This method should only be used when you can't do either of the methods above. Remember, if you don't have a high Defence level to do the magic dart method, you can use magic dart instead of fire blast. You should have full prayer. This method doesn't really require an order, because you will be praying against every brother (except Ahrim). In any case, tackle Dharok first. Then take a dose of prayer potion, and go to Verac. Then take another dose and kill torag. Take another 2 doses and kill Guthan, then another 2 to kill Karil. You may choose not to pray against Ahrim if your food supplies are high. If you don't think you will make it through the tunnel, you should pray. Anyway, range Ahrim until he dies. To reemphasize my earlier point, this is a bad method of doing barrows. Get 55 slayer, and it will be a lot easier. 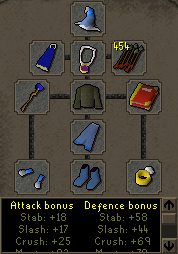 Only try this if you really want to do barrows, and you don't have 55 slayer or have not completed desert treasure. You may have heard me mention the barrows tunnel system previously. If you don't know what it is, look here. Basically, the tunnel system is the location of your last battle, and of the rewards chest. 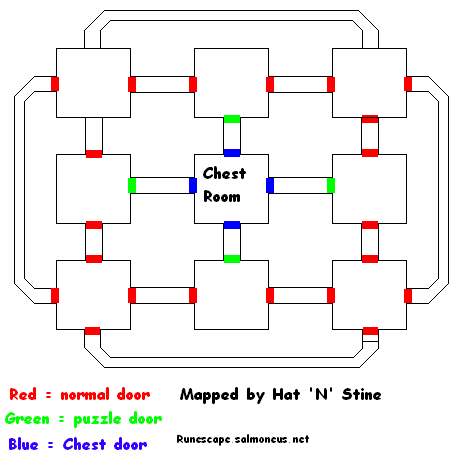 You will be walking around a maze of rooms filled with various types of medium level creatures. 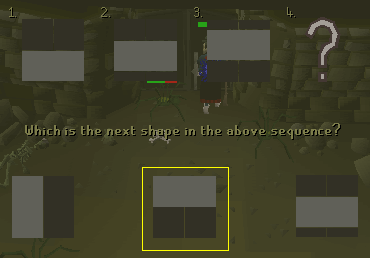 Your mini-map will become completely black, so you cannot use it to navigate throughout the maze. This is by far the most dangerous part of your barrows expedition, because the last brother can appear by surprise and kill you while you're getting ready. Walk around, opening doors. The brother will eventually spawn when you open one of the doors. It is random how many doors you have to open, and which door you have to open. For example, I could find myself fighting the brother when I open one door, or my hundredth door. Go straight to the chest. The chest will always be firmly closed, and when you attempt to open it (granted you haven't already killed him), the final brother will appear, trying to protect his treasures. Of course, you will not let a flimsy level 115 get in the way of money, so kill him, open the chest and get your treasure. Once you are through the last brother, through the puzzle doors and through the creatures, you should be at the chest. Open it, kill the brother if you need to, then search it and get the loot. You should then either teleport out (to lumbridge if you used my inventory examples) or run back to the ladder you came in from, before the tunnels collapse, and get out of there. Dragon medium helmets are the rarest rewards, closely followed by barrows equipment. The average of getting one of these is about every 15 trips. If you've done the Legends' Quest, you can also use a Combat Bracelet to teleport to the Monastery, recharge your prayer, use the Edgeville bank to store your earnings and restock your food and prayer potions, and use the Fairy Ring just east of Edgeville to go to the Canifis Swamp Dungeon. When your Combat Bracelet runs out of charges you can just use the Fairy Rings to go to the Legends' Guild to recharge it. With this method you don't need to use any runes for teleportation, and it is entirely free. Still use the Ectophial to get away if you're being attacked and can't teleport with your bracelet. Alternatively, you can run out of the barrows tunnels once you've searched the chest, and end up back at the barrows, ready for another trip. This is faster, but you will go through more doses of prayer potions, because you don't have the advantage of an alter. 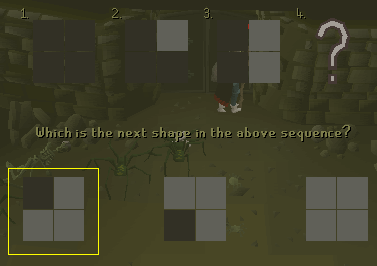 Another option is if you have a Portal Room and Chapel in your POH, bring a Teleport Tablet with you to the Barrows. Break the tablet to be teleported back to your house, head to your chapel and recharge your prayer. Then use the Kharyll Portal (Canafis Portal) to teleport to Canafis and head back to the Barrows. If you want to cut down banking and travel time, you can bring noted Prayer Potions, food and a few thousand coins, and use the general store in Mort'ton to un-note your pots and food. If you do this, bring more runes and arrows too. You will have to run back to the ladder after you've searched the chest. Make sure you have above 80% energy and a bit of food left before searching the chest. If you've completed the In Aid of the Myreque Quest, you can use the bank in Burgh de Rott. You won't need to waste money buying back your unnoted food from the shop. If you are noting your potions and food, remember the location of the ladder you go down. Each trip, the ladder is in a different corner of the tunnels. This is random, and you wouldn't want to get lost. A ring of wealth doesn't increase your chances of getting Barrows equipment or a good reward from the chest. Your kill count from the tunnels doesn't increase your chances of getting Barrows equipment from the chest, but it does increase the amount of runes you get. Don't bother getting it up though, because it doesn't make much difference and just wastes your time. You don't need to kill all the brothers to get a reward from the chest, but the more you kill the better your reward. You will still be able to get a reward even if you kill 1 brother. The Mysterious man wandering around above the mounds only says that this is a "dangerous" place, but as long as you follow these instructions it isn't, so just ignore him. If you log out, teleport out or die, your kill count still stays the same. The only way it can reset it if you search the chest. This means that if you die while fighting your last brother, all your previous work would not be in vain, because you'll only need to kill the last brother to get the full reward from the chest. It is best playing on high detail while in the tunnels and the tombs especially. This is because a faint head shows up on your screen whenever your prayer is drained. When you see this head, make sure you check your prayer points to ensure they are high enough. You are able to use cannons at the barrows, but do so only in desperation. You can set it up before searching the tomb, then position the brother on the other side of the sarcophagus, and slowly wait for him to die. However, this takes a very long time, and is not usually effective in tunnels. I would advise against it. While going through the yellow route on the map, you may want to stop by at the nature alter, if you've completed the Nature Spirit Quest. 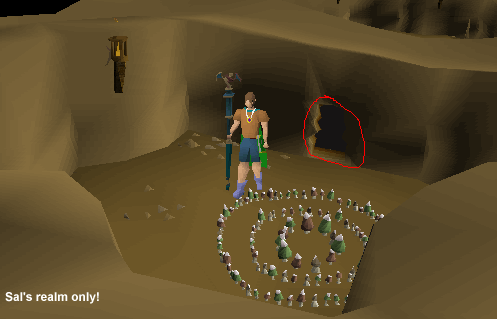 You can recharge your prayer here instead of lumbridge, and get a bonus 2 prayer points, like the monastery. This section covers all of the important info about the different Barrows sets, including equipment stats, prices, repairs, and a FAQ. The set's special is Wretched Strength, which hits your opponent harder depending on how many Life Points you have remaining and what your Strength level is. A good way to find out is to take a visit to the Grand Exchange, go to the buy section, and type in "Barrows" on the search screen. All the sets will show up right there, so click on one of them to see its price. Of course, this extra-strong (but very old) equipment has a disadvantage: it can decay! The first time you equip a piece of equipment it will be in perfect condition, at 100. As soon as you start fighting with it, the armor or weapon will start to degrade over a period of 15 hours. Your equipment will only decay while in battle, so if you aren't fighting, it won't decay. Of course, it costs to have these armor sets repaired so that they can be useable again. This means that to repair a full set, it will cost 330,000gp! These sets aren't as expensive to repair as Crystal equipment, but it is best to only use this armor against enemies where you'll be gaining a substantial profit (when averaging in the cost to fix your equipment). You can also have your equipment repaired while it's still in decent condition, and it will cost less to repair it. With the release of Construction, you are now able to repair your own Barrows Armor. If you set up a WorkShop in your Player Owned House, you will be able to build a Repair Bench. Use your damaged armor with this bench, and you'll repair it! If you have level 1 Smithing, the cost will be about the same as usual. The higher your Smithing level, the less it will cost to repair your armor. Q. Where can I get these armors? A. You can get them from 2 places : you can buy them from another player, the best place is world 2, or you can go and try the barrow's mini game yourself where you might get some pieces of armour if you try hard enough. Q. Can you wield a shield with Guthan's, Verac's or Ahrim's weapon? A.No, you cannot wield a shield of any type with barrow's weapons. They are all 2 handed weapons. Q. Is the armour wearable when it is completely damaged? A. No, the armour is not wearable when completely damaged. However, if it degrades while you're in combat, it will still appear on your character, only it will not give any bonuses. When you take it off, you must get it repaired to wear it again. Q. Do the armour stats decrease as the armour decays? A. No, the armour stats stay the same, even when the armour decays. Q. Do the specials work when not wearing the full set? If so, what item do you need for the special to work? and do the specials work with degraded armour? A. The specials only work when you are wearing the full set, not just parts of it. And the special works as long as the armour isn't 100% damaged.